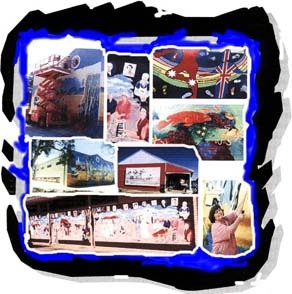 Western Australian Mural Artist Irene Osborne, is experienced in painting home murals and tromp l'oel features, historical murals, and assisting with community murals. Wall Murals may be a large or small trompe l'oel, of a vista or scene appearing to be real. It may be a painted arch, doorway or window that visually "opens" up the room or courtyard with an idyllic, restful or fantasy scene. Themes are as broad as your imagination and Irene can help you through from the design to completion, whether you need a home mural, business mural or town mural. Historical Murals assist in promoting the identity, culture and heritage of towns enhancing tourism, and boosting the local economy. Create a lasting impression and enhance your surroundings with a mural feature from this experienced Perth Artist in your home or business, check out the mural portfolio, then contact West Australian mural artist, Irene Osborne soon, to assist you to develop your idea or vision into reality! ENQUIRIES WELCOME.